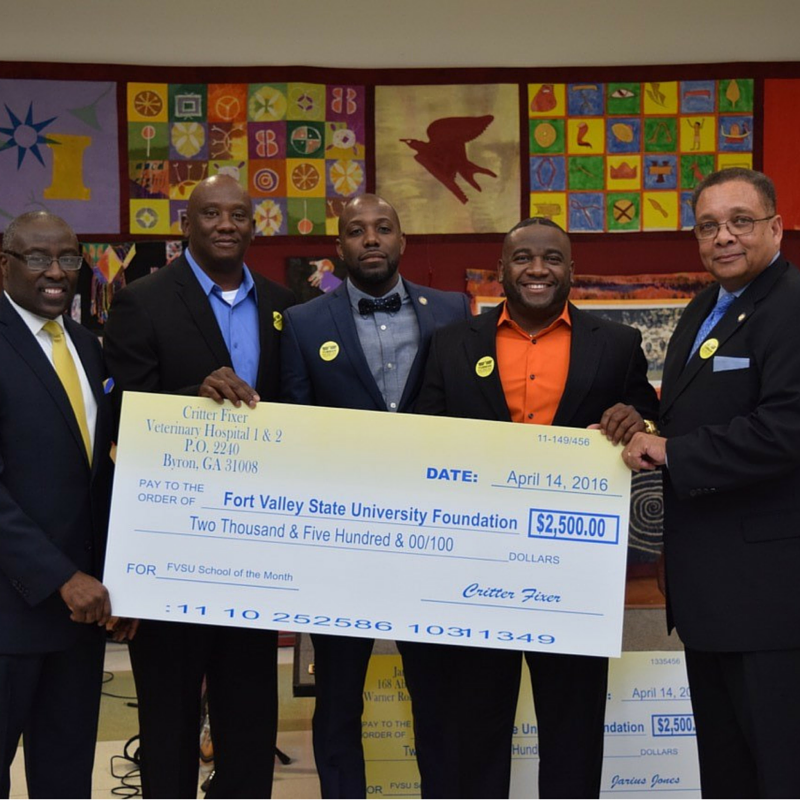 April 19, 2016 – Two Fort Valley State University alums recently donated $2,500 to Fort Valley State University during a special event held at a local museum. Veterinarians Dr. Terrance Ferguson (second from left) and Dr. Vernard Hodges (second from right), who own Critter Fixers Veterinary Hospitals, presented a check during the “FVSU Night at the Tubman” Museum recently in Macon. Accepting the check on behalf of the university was FVSU President Dr. Paul Jones (left), FVSU School of the Month chair Jarius Jones (center) and FVSU National Alumni Association president/FVSU Foundation Board of Directors member Melvin Douglas Morris (right). Jarius Jones, who also is a member of the FVSU Foundation, Inc. Board of Directors, presented the first $2,500 check of the evening as part of the fundraising effort that will include FVSU being featured on the nationally syndicated Tom Joyner Morning Show during the month of November 2016 in an effort to raise money for student scholarships. View highlights from the “FVSU Night at the Tubman Museum” at https://www.youtube.com/watch?v=mN7aO7bmhP8.